The Center for Sports Medicine and Performance at The Children's Hospital of Philadelphia is the region's premier healthcare resource for young athletes. They are specially trained to meet the unique needs of young athletes and provide a comprehensive range of services, including medical management, injury prevention strategies, nutritional counseling, and performance enhancement training. At The Center for Sports Medicine and Performance at The Children's Hospital of Philadelphia, they believe that injury prevention programming and education are the cornerstone of a successful youth sports program, and therefore offer proactive injury prevention programs to strengthen key muscle groups and enforce proper technique so your athlete can play safely and reduce the risk of injury. CHOP experts, Dr. Naomi J. 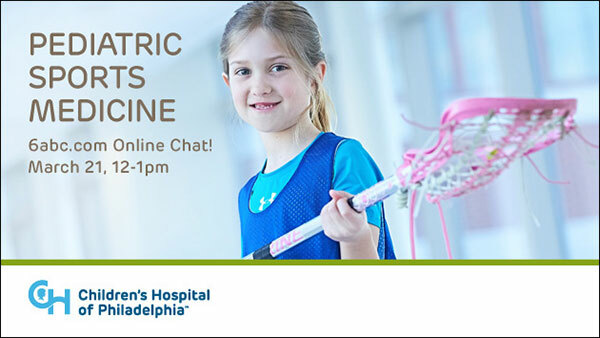 Brown and Dr. Christian D. Turner from The Sports Medicine Center at The Children's Hospital of Philadelphia will be online on Tuesday, March 21st from 12-1 pm to answer your questions about pediatric sports injuries, prevention, treatment, etc. What are the most common sports injuries in children and young adults? Are certain age groups at a higher risk? Do these injuries occur more in male or female athletes? Why do children and adolescent athletes require special care when they are injured? What can parents, coaches, trainers and the young athletes themselves, do to prevent a sports injuries? Naomi Brown, MD, is a graduate of Tufts University and Tufts University School of Medicine, both in Boston, MA. She completed her pediatrics residency at The Children's Hospital of Philadelphia, and a specialized fellowship in sports medicine at Boston Children's Hospital. Today, Dr. Brown works at CHOP's Main Campus in Philadelphia and CHOP Care Network location in Voorhees, NJ. Christian Turner, MD, is a graduate of the State University of New York School of Medicine, completed his residency at Connecticut Children's Medical Center and a specialized fellowship in primary care sports medicine at The Children's Hospital of Philadelphia. Today, Dr. Turner works at CHOP's Main Campus in Philadelphia and CHOP Care Network location in King of Prussia, PA.